This paper describes how XMLQuire provides a uniquely efficient, precise and fluid editing experience which is quite new and has more in common with word-processing than the humble text editor. Naturally, XMLQuire provides an extensive set of features, ranging from XPath tracing to Find and Replace preview capabilties, these aren't all touched on here but details are in the documentation. Word-wrap is enabled by default, so XML text will naturally flow within the viewable region, but unlike conventional editors, it will always appear properly indented so the XML context is clear - a hanging indent provides a visual clue to show where word-wrapping has occured. 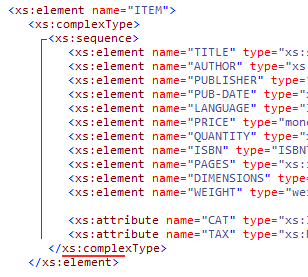 When there's an associated schema, auto-complete will help quicken entry of element and attribute names and values. You can either use auto-complete from a drop-down list or, for adding inline markup to existing text, a permanently displayed 'expected particles' list can be used to quickly add wrapper elements where required. XMLQuire's element cursor can, unlike other editors, follow the indentation in from the left-margin, so its always in view and providing context on the currently selected element. When XML is not well-balanced, this cursor changes shape and color to subtlely indicate the last position where a close tag should be placed. Hover the mouse near the cursor and it will thicken to a bar, this can easily be clicked to select the element and its content for a further editing operation; such as drag and drop. 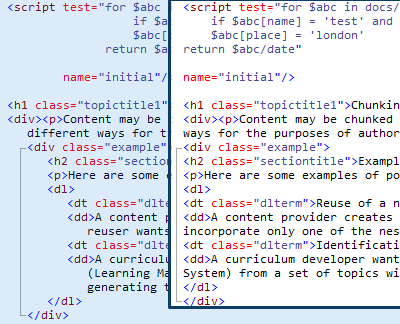 Tags and attribute values provide 'resistance' during 'press and hold' keyboard delete actions, to prevent unintentional corruption of the XML when you're working within text content. The words here touch on, but can't do full justice to, the unique editing experience provided by XMLQuire's innovative virtual formatting technology. This combines with an extensive feature set to to provide a compelling alternative to conventional XML edtiors. I encourage you to download the free XMLQuire editor now and try it for yourself. Copyright © 2011 Qutoric Limited. All Rights Reserved.